I think that's well beyond enough. I think that Viggo is a Corded Nordic. Liv Tyler looks like a Med/Nordic mix. The others I can't remember what name goes with what face. 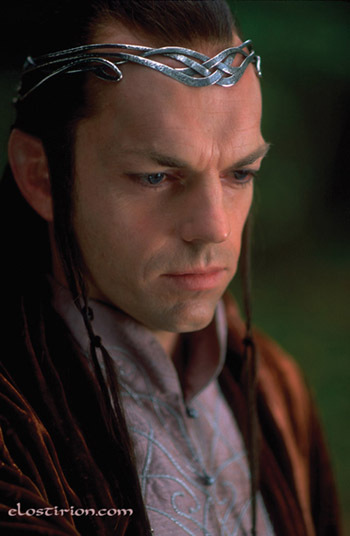 I was wondering, what is that guy who plays Elrond? His forehead is GIGANTIC (probably taller and wider than the rest of his face put together... :laugh) So, what is he? Attach a photo or provide a link to one. Here's a photo of Elrond. You can kind of see his huge forehead here. It's large and also very 'ridgy.' There are also weird ridges above his eyebrows... What type is associated with this? Why didn't you say you were talking about Hugo Weaving. He is a Nordid type. Oops! I didn't know that was his name. I only knew him as "Elrond." Steven Tyler is a jew wich makes Liv Tyler a half jew at least. Elija Wood is also jewish.